The Occupational Safety and Health Administration (OSHA) has adopted a blood-borne pathogen standard to protect workers against infection from hepatitis B virus, AIDS, and other blood-borne pathogens. Workers at risk of exposure to blood and other bodily substances that could be infectious include doctors, nurses, dentists, lab workers, pathologists, phlebotomists, emergency medical personnel, research scientists, dialysis workers, medical examiners, maintenance personnel, and funeral service personnel. If you have suffered an illness due to blood-borne pathogens that you encountered on the job, you should contact the Boston workers’ compensation attorneys at Pulgini & Norton. 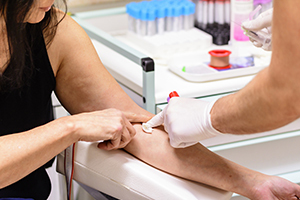 Health care providers are supposed to take steps to make sure that workers and others do not encounter blood or other potentially infectious substances. They are also supposed to take precautions related to bodily fluids. Many employees are allowed to exercise their professional judgment in connection with protective equipment. When employees experience on-the-job exposure to a blood-borne pathogen, they may contract a serious illness. If you develop an illness that you believe was a result of exposure to a blood-borne pathogen, you may have grounds to obtain workers' compensation benefits. Any illness that arises from a workplace event is covered by the workers' compensation laws. Because of the unusual nature of this type of work-related injury, however, you will need to show a causal relationship between the event and the resulting disability. You may need to submit medical records, correspondence, and physician statements. What if you had a pre-existing condition that made you more susceptible to a blood-borne pathogen? If a compensable disease combines with your pre-existing condition, which arose from an event that is not compensable, and it causes a disability or a need for medical care, you likely can obtain compensation. Even if you had prior problems that affected your immune system, you may be entitled to workers' compensation benefits as long as the blood-borne pathogen exposure was a major cause of your disability. The exposure need not even be a predominant cause of the resulting disability in order to obtain the benefits that you need. To be considered a major cause, the work injury does not need to be responsible for more than 50% of your condition. The benefits to which you may be entitled include medical expenses, prescription costs, medical mileage, vocational rehabilitation, temporary partial disability benefits, temporary total disability benefits, permanent partial disability benefits, permanent total disability benefits, and more. If a worker passes away due to a blood-borne pathogen encountered at work, their survivors may be able to recover death benefits. Many people do not realize that workers' compensation benefits are also for work-related illnesses, rather than just injuries. It is important to retain a job injury attorney who can help you establish a link between a work event and a sickness that you developed. If you have been harmed by a blood-borne pathogen at work, Pulgini & Norton's Boston workers' compensation lawyers are available to help. We also represent claimants in Weymouth, Braintree, and Andover, among other Massachusetts communities. Call us at 781-843-2200 or complete our online form to schedule an appointment with a member of our firm.